Rated 5 out of 5 by coffeekid from Wow, some of the reviewers here are dim.... This is a re-imagining of farm frenzy after fifty million FF3s it is nice to see something new. The pigs and the chickens like each other. The first time they meet you get a special egg. If you click on this every animal on the board will instantly produce a good, even if they have just produced. I have used this to get gold on some levels. You can see what is in storage because there is a massive green bar under the storage area the more green you can see the fuller it is, when it is all green it is full. Some levels are more challenging than others and having gone off FF in a big way because it was frankly getting dull this has got me back on board. That said I actually looked at the game and how it worked, from the sounds of it most reviewers haven't. 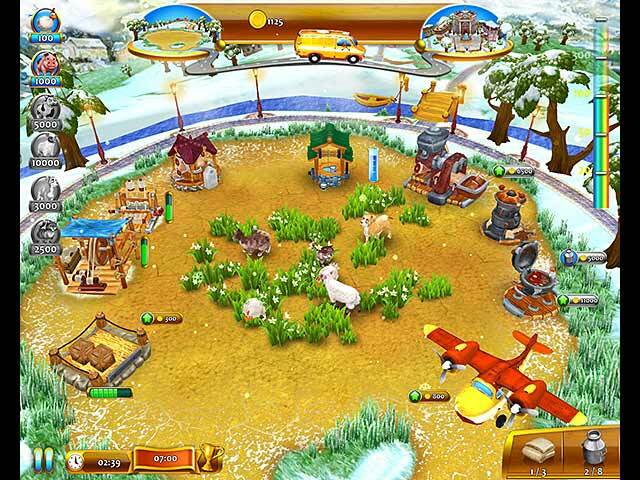 Rated 5 out of 5 by Donna_Bella from So Much Fun I finally decided to give Farm Frenzy a try. I'm so glad I did. It's been a blast. Since I didn't play the previous versions, my take on it is completely fresh. I'm sorry to hear that those who loved the earlier Farm Frenzy games weren't happy and some of the points made sense. I hope future versions include most things veteran fans loved and miss because I could see those changes making the game even better. I'll be looking for Farm Frenzy 5. That's for sure. Rated 5 out of 5 by brod_tygrammy from One of the Best Farm Frenzy Game Not sure at first... but as I kept playing I found this one of their best games. Somewhat different from the other Farm Frenzy; however, after playing all of the Farm Frenzy games, we needed a little change. Keep coming Farm Frenzy! Rated 5 out of 5 by harmony from LUV THIS GAME I haven't made a review before but I have played all the farm games and I just love this one. I'm playing now and am pleasantly surprised at the upgrade from the other farm frenzies, Its slightly like the others but I think it is all adorable. I can't believe the low ratings for it. I love the having so much to do to find things while your playing to up the money and the way you catch the bears is cool. I almost didn't try it because of the first 2 ratings but have been burnt before by buying when all said it was great and then having it bore me to death. But this is truly a game all should try. The only complaint I would have is a little more detailed instructions on the exchange items. Rated 5 out of 5 by SazlySaz from Nice to see some changes! I have played many of the other Farm Frenzy games, and I was beginning to actually forget which one I was playing, as they were all SO similar with just the odd tweak here and there. The 3D graphics are a real treat, and while the screen sometimes feels a little too busy, the birds/butterflies etc flying past add a new dimension to the playability! I've bought this and I'm enjoying it immensely! 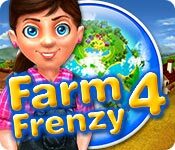 Rated 5 out of 5 by cheli7 from Farm Frenzy 4 The gameplay is exactly the same as all the other Farm Frenzies. Yes, the screens are different...3D...but the animals are still cute, IMO, and I have to say, I like this game as much as the other Farm Frenzies. Rated 5 out of 5 by Talarin from Updated version of old favorite A lot of people are complaining about this game, but it is, essentially, the same old Farm Frenzy with a different interface. You can't just instantly jump in and play; I think there was a 5 minute learning curve. I know people hate change, but this really is a fun game. Think of it as you would any other new game, give it a chance, and see if you like the trial. Rated 5 out of 5 by BonanzaBro from Nice try Welcomeback Farm Frenzy, nice 3D-try! Rated 4 out of 5 by farquharld from Different but still fun! I know many people don't like the new 3D effects, but I still love this series! Sad that they aren't continuing this series! Rated 4 out of 5 by EmilyTheKat from Lots of Fun I hate time management games as a rule but this was loads of fun. Decent graphics, reasonably entertaining story line, challenging.... all I could ask for. Rated 4 out of 5 by abbyismyfurbaby from better than reviews would have you believe I liked the changes from the original series - just need to keep an open mind from the start! Rated 4 out of 5 by onnozaga from Much Better!! I think this version is much better. However you should try it yourself. I like the improvements in levels, because in previous versions there were so short and fast levels which i hate. Visual quality is the only annoying part of the game. 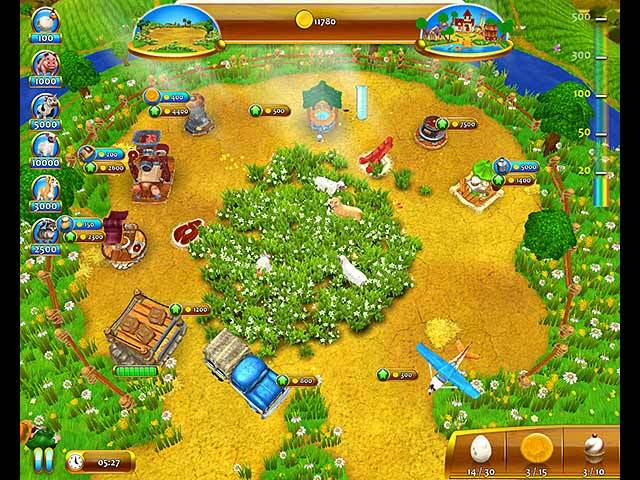 I think farm frenzy don't need 3D graphics. Rated 4 out of 5 by Yaelle from Its A Fine Game! Why So Negative?! I just played about 55 minutes of the demo & am strongly considering buying this. I own every single FF game out there, as about 2 months ago I had run across a disc in a store that had around 5 (more, maybe) all on one disc & I had already owned most of the others. Sure, this is different than the other FF games but guess what? The criticism on all of the message boards about the other FFs was exactly about how they were all the same!! Now that these guys have gone & changed things up, people are complaining. Shouldnt do that. This isnt the greatest game in the world, but its fine! Rated 4 out of 5 by Catz142 from That Darn Cat My views of the game really don't differ much from the other reviewers. Graphics OK, Game play a bit boring, No real challenge for goals. BUT.....That Darn Cat....Can you please shut it up. It drove me mad meowing every time it picked up an item. Had to turn volume down in the end. Rated 4 out of 5 by Justy1002 from Sheesh, why so negative people? After reading all the trashy reviews, I was bracing myself for an udderly (pun intended) horrendous experience. After completing the demo, with 1 minute left in the actual 60 minute trial (the game ends at a certain point whether you've used the 60 minutes or less), I was perplexed at what the big deal was about. Yeah, the game is much different from all the previous installments, which I've all purchased and I can honestly say this was a nice change. The 3D was a nice feature and the graphics were anything but ugly. The music was fun and the storyline, something I rarely give a moments notice to, was good. In previous reviews it was mentioned that you couldn't tell the chicken from the egg. With a minor adjustment via the mouse wheel, you're able to see eggs and meat, etc. If you are already searching/attempting to click on hidden items or passing butterflies, then you are already engaging that mouse wheel. I for one like the idea that I don't have to collect stars anymore in order to upgrade things. Someone also mentioned they couldn't tell how full the warehouse was. Mmmm, that's what the metered bar on the warehouse is for. It fills in green from left to right and you'll know it's almost to capacity when it's nearly full. You can still use frenzied clicks on machines to make an item faster, although I never had a machine turn red from too much clicking like previous installments. I like the multiplier idea a lot. Sometimes I found my focus elsewhere rather than on my goals which created a real challenge - oh snap! I will agree that at first, the menu was confusing as to advancing to the next levels after the tutorial stage, but that was quickly resolved. Overall, it's not the same old same old Farm Frenzy from yesteryear. So if you don't like change, then I guess this isn't the game for you. I only gave it 4 stars because let's be honest, even with the changes, it's still Farm Frenzy #128894409. I recommend that you try the demo and form your own opinion. I almost made the mistake of thinking that all these negative reviews can't be wrong. Rated 3 out of 5 by moonflower994 from No, not for me This was too clumsy and confusing for me .I prefer the others. Rated 3 out of 5 by sparx845 from Lacking I was VERY excited to try it out and even bought it. Leaning towards disappointed. I own all the Farm Frenzy games and this one is nearing annoying if not there already. From the cat that constantly meows while picking item up to the animals themselves by not moving off the products they give. Compared to Farm Frenzy 3 this one is waaaaaay off the mark in all areas. Rated 3 out of 5 by sugarbelle from My least favorite of Farm Frenzy games Maybe it's just me. Maybe I'm burned out on Farm Frenzy games. After Farm Frenzy American Pie which was such a delight this fell a bit short. Still, I would recommend it if you've never played FF you'll probably love it. It's just that the first 3 are better. Rated 3 out of 5 by ydouneed2kno from Not what I was expecting at all I've played all previous versions and had been looking for version 4 for a while. After seeing some of the visuals for 4 online, I was surprised when I actually got the game and it was nothing that I expected. There are some things that may it more pleasant, but it's still not as challenging as the previous games. There were other levels that I really had to work to get pass, I got through the entire game with little effort. Not very challenging. Disappointed!!!! Rated 3 out of 5 by Bjat01 from Farm Frenzy four I love all the other farm frenzy games, I have them all, and still play them! With Farm Frenzy 4, I was very disappointed when it was so different to the other FF's. I also found the graphics and screens confusing. I will continue to play it out and see what happens. Rated 3 out of 5 by Monkeimom from A huge disappointment After loving all the previous versions of farm Frenzy, this one is a poor "upgrade" I recommend trying the trial before purchasing. I have not seen improvements from the tutorial to the normal game. Rated 3 out of 5 by Symeezcatzlady from On the Fence I own all the Farm Frenzy games & love TM games in general. I was excited to see a new FF offering. I read the reviews before downloading & I wanted to love it. BUT...the graphics were disappointing & I was frustrated that I couldn't make the machinery work faster. Played the entire demo before my trial hour was up & wanted more levels to play to assess the game. I can't decide whether I liked it enough to buy it. Maybe I'll wait until I have an extra game credit or Big Fish has a BOGO promo. Rated 3 out of 5 by agedbeauty from Not the same I, like Rogue Slayer, have all the other Farm Frenzy games but this one is not up to the others. They have tried to make it 3D and in this respect have succeeded, but it lacks in almost every other way.The animals don't have the same cuteness and it's all very childish looking.The tutorial lacks English grammar, English is obviously not the native tongue of the programmers. The basic concept is the same, get animals, collect products, process products, sell products reach the goal that is set for that level. It just doesn't have the same feel. Try it, you might like it! It's personal preference. Rated 3 out of 5 by GloomySunday from Lots of changes Well, I'm pleased to see that Farm Frenzy finally came up with some real changes. Most of the changes I liked, so let's start with the good stuff: - The tutorials can be skipped! Yay! It was was one thing that annoyed me tremendously in previous versions - having to go through the tutorial again and again - You can click on the storage to see how many items you have in there. Wasn't possible before, unless the transportation vehicle was there - Selling menu looks nicer and more streamlined, even seems easier to me. - If you catch three bears and sell them, they count as one item, meaning that they only take one space on the vehicle. Much nicer than before - more stuff can be sold at once. They put in some little extras, such as a surprise egg created by chicken and pigs, but I haven't been able to find out what effect this special egg has. Also, there's an owl (or something) flying about and if you click on it, you get some money. Those additions are okay, I wouldn't have needed them, but they don't harm the gameplay. Two big weaknesses make me unsure whether to buy the game though: - Graphics are not to my taste at all. I could live with that if it was just a matter of taste, but I acutally find them confusing. Everything looks more cluttered, less tidy, I don't always recognize the machines, a lot of the clarity that I used to like in Farm Frenzy is gone and that's impairing game play. - You cannot see how full your storage is. Yes, you do see an area with boxes, but you can't tell exactly when it wil be full, so you suddenly end up with a full storage. I far more preferred the storage image of the old Farm Frenzy versions where you could see exactly how much space one product took and how much space there still was. There is also the issue that apparently you don't need to buy improvements anymore, at least it was like that during the trial. Upgreaded or new machines are just there when needed. 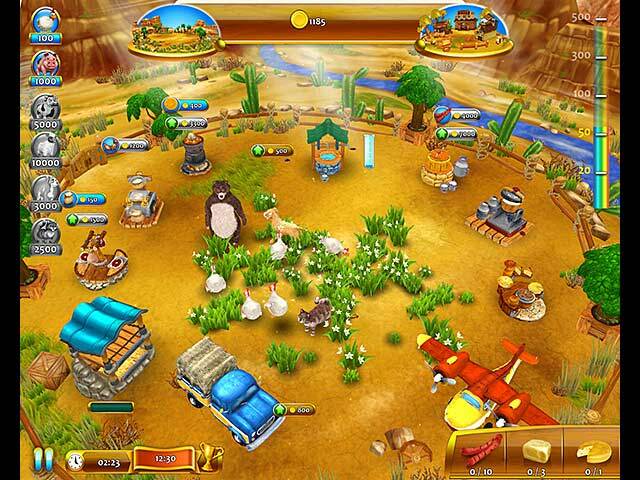 What made Farm Frenzy so challenging was that you had to save up money for new machines etc. and so had to get good results in the levels. Here, I didn't particularl care whether I finished on expert time or not as it made no difference - I didn't need to save any money for anything. So that does take a lot of the challenges away. To sum up - nice new additions, unfortunately there also changes that make gameplay less fun. Rated 2 out of 5 by Blah2014 from Go back to 3! I have played - and loved - all the Farm Frenzy games. However this game, was awful. Every time I touched the mouse, I zoomed in or out - which made me lose time within the game. This '3D' game, makes it hard for you to choose your own options as to whether you want to buy, sell or manufacture certain things at your own time - this game makes you do what they think is right for you. My 8 year old loves this game. BecaUse that is who is it is geared towards. Rated 2 out of 5 by bubsy625 from Why complicate things? I love the farm frenzy games and was thrilled there was a 4. however, that thrill was short-lived once I played long enough to realize I could not warm up to this game. Too many visual layers, too slow to gain points to upgrade, Just too much. I order a game like very other day and I must say this was in my top 5 worst game experiences. Rated 2 out of 5 by anamneses27 from Not Impressive As a buyer of nearly all previous FF games I was really disappointed. Changes can be very beneficial but the ones made here just didn't impress me at all. I didn't care for the graphics and gameplay. I WON'T be buying this game. I wish developers would pay closer attention to the gamers. Rated 2 out of 5 by Beckiep from Disappointing at best This isn't anything like any of the other FF games. Sure, the basic premise is the same, but that's where the similarities end. The graphics make products difficult to see, thus difficult to collect., The views don't make things easier and when I tried to zoom in/out, I ended up making myself nauseous. I've played all the other FFs and couldn't wait for this one. I usually get completely absorbed in them. I played 20-30 mins of the trial and couldn't wait for it to end. In fact, I didn't play the full trial time. Very disappointing.